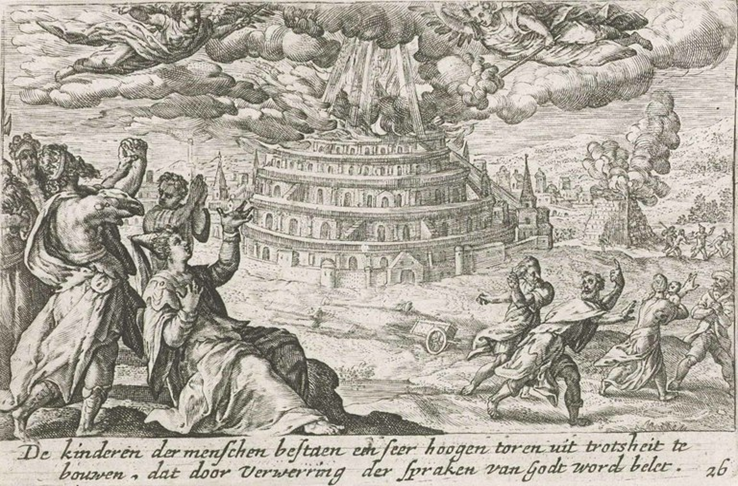 Ellen White (1827-1915): “The dwellers on the plain of Shinar disbelieved God’s covenant that He would not again bring a flood upon the earth… One object before them in the erection of the tower was to secure their own safety in case of another deluge. By carrying the structure to a much greater height than was reached by the waters of the Flood, they thought to place themselves beyond all possibility of danger. And as they would be able to ascend to the region of the clouds, they hoped to ascertain the cause of the Flood” (PP, p. 119). Daniel Defoe (1660-1731): “I must confess I am sometimes apt to vindicate our old ancestors, in my thoughts, from the charge itself, as we generally understand it namely, that they really designed to build a tower which should reach up to heaven or that it should secure them in case of another flood…how absurd it was to suppose…that they could build firm enough to resist or high enough to overtop the waters, supposing such another flood should happen” (The history of the Devil, pp. 111, 112, 1854 [first published in 1726]). Ellen White (1827-1915): “Many of them denied the existence of God…The whole undertaking was designed to exalt still further the pride of its projectors and to turn the minds of future generations away from God and lead them into idolatry… other apartments, splendidly furnished and adorned, were devoted to their idols… and as the minds of the people were darkened by idolatry, and as the minds of the people were darkened by idolatry, he led them to counterfeit these offerings and sacrifice their own children upon the altars of their gods…” (PP, pp. 119, 120, 123). Daniel Defoe (1660-1731): “…he had led them into a blind subjection to himself… worshipping horrible idols in his name, to whom he directed human sacrifices continually to be made… It was sufficient to bring mankind to a neglect of God, to worship him in halves, and give little or no regard to his laws, and so grow loose and immoral, in direct contradiction to his commandments; this would not go down with them at first; so the devil went on gradually. From a negligence in worshipping the true God, by degrees introduced the worship of false gods… so in a few gradations more he brought them to down-right idolatry… Satan brought mankind to adore every block of their own hewing… and at last the Devil himself” (The History of the Devil, pp. 85, 117, 118, 1854 [first published in 1726]). Ellen White (1827-1915): “Angels were sent to bring to naught the purpose of the builders. Their confederacy ended in strife and bloodshed. Lightnings from heaven, as an evidence of god’s displeasure, broke off the upper portion of the tower and cast it to the ground” (Patriarchs and prophets, pp. 119, 120, 1890). 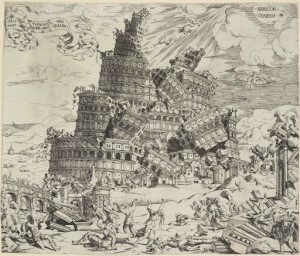 Karl Fredreich Keil (1807-1888); Franz Delitzsch (1813-1890): “Of this city considerable ruins still remain, including the remains of an enormous tower, Birs Nimrud, which is regarded by the Arabs as the tower of Babel that was destroyed by fire from heaven (Keil & Delitzsch Commentary on the Old Testament, 1866). 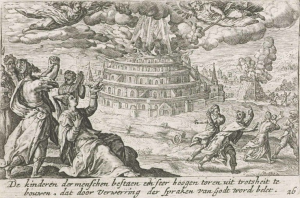 Book of Jasher (Hebrew text 1629): “And as to the tower which the sons of men built, the earth opened its mouth and swallowed up one third part thereof, and a fire also descended from heaven and burned another third, and the other third is left to this day” (Chapter 9: 38, Translated from Hebrew into English in 1840, 1887). Richard Walton (1781-1833): “Tertullian says: “It was the Son who judged men from the beginning, destroying that lofty tower, and confounding their languages” (Theological Institutes, Vol. 1, p. 179, 1831). Ellen White (1827-1915): “They had built their tower to a lofty height when the Lord sent two angels to confound them in their work… the angels confounded their language” (SR, p. 73, 1947). 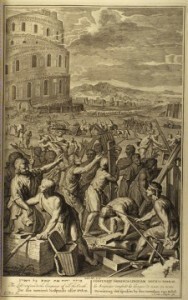 The Book of Jasher (printed in Hebrew in 1625 AD and was translated into English in 1840): “And God said to the seventy angels who stood foremost before him, to those who were near to him, saying, Come let us descend and confuse their tongues, that one man shall not understand the language of his neighbor, and they did so unto them….And from that day following, they forgot each man his neighbor’s tongue, and they could not understand to speak in one tongue, and when the builder took from the hands of his neighbor lime or stone which he did not order, the builder would cast it away and throw it upon his neighbor, that he would die…. And they did so many days, and they killed many of them in this manner” (Chapter 9:32-34). Targum Pseudo-Jonathan (1591): “And the Lord said to the seventy angels which stand before Him, Come, we will descend and will there commingle their language, that a man shall not understand the speech of his neighbour… and with Him seventy angels, having reference to seventy nations, each having its own language, and thence the writing of its own hand: and He dispersed them from thence upon the face of all the earth into seventy languages. And one knew not what his neighbour would say: but one slew the other; and they ceased from building the city” (Section II, 1862). Ellen White (1827-1915): “messages were thus passing from one to another the language was confounded, so that material was called for which was not needed, and the directions delivered were often the reverse of those that had been given. Confusion and dismay followed. All work came to a standstill. There could be no further harmony or co-operation. The builders were wholly unable to account for the strange misunderstandings among them, and in their rage and disappointment they reproached one another. Their confederacy ended in strife and bloodshed… As men turned away from God, the divine attributes—justice, purity, and love—were supplanted by oppression, violence, and brutality (PP, pp. 119, 120, 123, 1890). Daniel Defoe (1660-1731): “This presented Satan with an opportunity to break in upon their morals at another door, namely, their pride; for man being naturally proud and envious, nations and tribes began to jostle with one another for room; …being numerous and strong, thrust the other out, and encroached upon their land; the other liking their situation, prepare for their defense; and so began oppression, invasion, war, battle and blood… The bringing mankind this war and confusion, as it was the first game the Devil played after the confounding of languages, and divisions at Babel” (The History of the Devil, p. 115, 1854 [first published in 1726]). Adam Clarke (1760-1832): In explaining the confusion that resulted, Clarke cites a poem by Mr. Sylvester: “Bring me,” quoth one, “a trowel, quickly, quick!” One brings him up a hammer. “Hew this brick,” Another bids; and then they cleave a tree; “Make fast this rope,” and then they let it flee. One calls for planks, another mortar lacks; They bear the first a stone, the last an axe. One would have spikes, and him a spade they give; Another asks a saw, and gets a sieve. Thus crossly crost, they prate and point in vain: What one hath made another mars again. These masons then, seeing the storm arrived Of God‘s just wrath, all weak and heart-deprived, Forsake their purpose, and, like frantic fools, Scatter their stuff and tumble down their tools” (Adam Clarke Commentary, Genesis 11:6, 1832). Anne Catherine Emmerich (1774-1824): “…but soon it was discovered that disunion existed among all. They struggled among themselves, they slew one another, they could no longer make themselves understood by one another, and so at last they separated and scattered over the whole earth” (Life of Jesus Christ and Biblical Revelations, Vol. 1, p. 53).